A collab made with AshleeNova of AH.com for Krall's Map of the Fortnight contest on althistoria.proboards.com. Full size here. 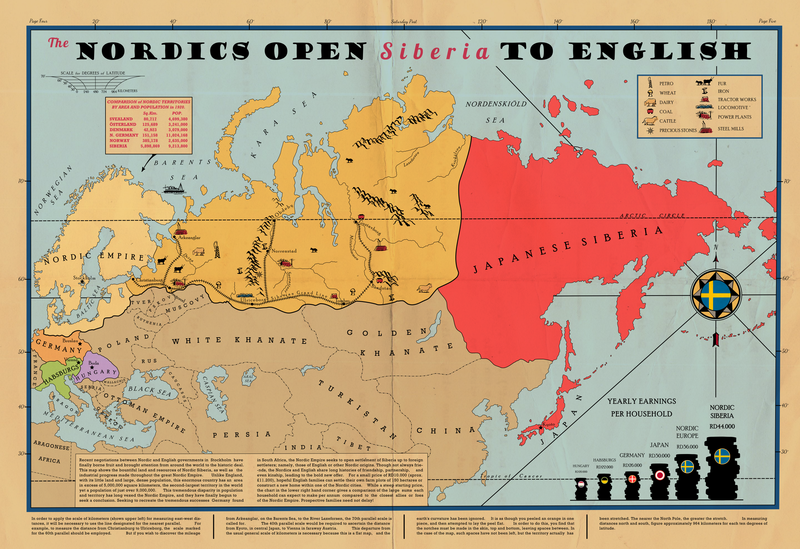 Taking advantage of the Muscovites unfortunate decision to fight the Mongols, the Nordic Empire, at the time the Kalmar Union, took the opportunity to expand into northern Europe as the Russian statelets fought amongst themselves and Mongolian subjugation. Under the first Emperor Olav, the Nordics took great strides in their eastward expansion, signing treaties with the native tribes of autonomy and cooperation in order to provide a Nordic led front against Mongol raiders. As time went on the Nordic Empire expanded into Germany and the Baltic coast, winning several wars against the Hansa and the ever shrinking Holy Roman Empire while handing the Teutonic Order several crushing defeats after they attempted to seize parts of the Empires Pomeranian Territory. Their Polish allies were key to victory in several of these conflicts, and the two nations have forged a strong and mutually beneficial alliance, dividing the Russian states into their own spheres of influence. In modern day the alliance is strong, with a Germany Confederacy acting as a the buffer and occasionally battlefield against the Valois Union of France and Spain, it has stood the test of time and battle, allowing the Nordics to hold their sway over the continent and secure the eastern frontier against the ever disintegrating White Khanate. If you liked this map, consider donating to my Patreon!